The Delivery of Things World Survey Report 2016 is out – Find out which burning questions and challenges need to be answered in the immediate future to gain a deeper business and technical understanding of DevOps. More than 250 international DevOps, Continuous Delivery and Improvement practitioners took part in the survey helping us define the top DevOps trends, disruptors and influencers. 52% of the professionals polled confirm a specific initiative driving DevOps adoption in their company. Collaboration between development & operations is the top DevOps adoption driver (48%). Top DevOps benefits: Increased efficiency (61%), increased deployment frequency (56%), decreased number of broken builds going into production. 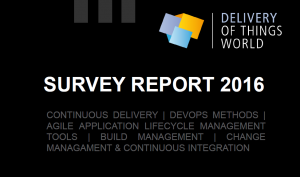 Download the Delivery of Things World Survey Report 2016 here to understand the top DevOps priorities in 2016 in terms of projects, trends and market overview.